Located off of I-17, in Camp Verde, the World’s Largest Kokopelli sits in front of a souvenir shop luring travelers and tourists in to the parking lot of the Trading Post. The giant statue is made from hand shaped and welded steel. Lowell Johnson, then owner of what at the time was the Montezuma Trading Post, came up with the idea to build the kokpelli. Prior to the kokopelli sat a hot pink 1920’s automobile in effort to attract tourists. Johnson, a local business man, and owner of the Oak Creek Terrace Resort, brought in an experienced blacksmith/artist and sketched out the design right on the sales counter. Made of 1/4 inch plate steel, the hand shaping and welding of the structure took weeks as the 12 cubic yard cement foundation cured. The statue’s instrument houses a speaker that plays music to visitors at they shop. By the end of the project, it had cost more than $25,000. For a while, there was a price tag hung in the event an interested buyer came along. 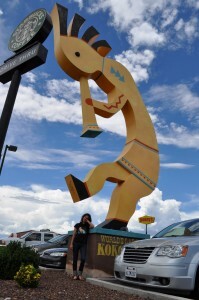 Posted on July 29, 2014 by League Staff in The Great AZ Road Trip | Tags: Arizona, Camp Verde, Kokopelli, road trip, tourism, Verde Valley | permalink.